During the festive season everything needs to taste – and look – just a little bit more special. For the freshest, nicest and most affordable flavourings and garnishes look no further than the herb garden! Most established herb gardens feature the standard herbs – sage, rosemary, lavender, mint, and thyme. With just this collection you can flavour festive punches and coolers, make delicious roasts, stuff a turkey and produce mouth watering sauces. Stuffing for roast chicken, turkey and pork. Combine the chopped sage leaves with chopped onions, sausage meat, and soft bread crumbs and bind with beaten egg. If you don’t want to make stuffing, just use the sage leaves to flavour the meat. Use common Sage, Purple and Tricolour Sage leaves. Sage and cream cheese dip with savory biscuits or gourmet bread as an entrée. Finely chop fresh sage leaves and a clove of garlic and combine with cream cheese, adding lemon juice to taste. Cover and leave in the refrigerator for a day to let the flavours develop. Use Pineapple Sage leaves and flowers to add a pineapple taste to cold drinks and fruit salads, or to give a sage-like aroma to pork dishes. Did you know: Sage is a digestive herb that helps our digestive system to process strongly flavoured or fatty foods that we over indulge in at Christmas. Growing tip: Don’t over-water Sage. It tends to droop if over watered and looks as if it is wilting, but resist the urge to water. Cut back after flowering to keep it bushy. Rosemary roast potatoes: toss par boiled potatoes (halved) in butter, salt and chopped rosemary. Place on a very hot baking tray and roast in the oven for 45 minutes or until gold and crispy. Turn a few times while cooking. Rosemary Fruit Cup made from handful of rosemary sprigs, 3 tbs of sugar and two-thirds of a cup of water brought to the boil and simmered for five minutes. Strain and pour the cooled mixture into a jug full of ice cubes and top with 450ml chilled ginger ale and half a litre of orange juice. Growing tip: Although rosemary grows slowly, it can become a large bush so give it space. Rosemary ‘Tuscany Blue’ is compact and upright growing. Rosemary grows best in full sun, and prefers a chalky soil that drains well. Peppered Lavender beef is an alternative to roast chicken or turkey. Lightly oil a beef tenderloin and spread coarsely ground mix of black peppercorns, fennel seeds, thyme and lavender flowers over the meat. Wrap tightly in plastic wrap and refrigerate overnight. Roast in a pre-heated over 220 for 15 minutes and then reduce the heat to 160 and cook until the internal temperature reaches desired temperature on a meat thermometer – Rare: 48°C ,Medium Rare: 52°C or Medium: 55°C . Let it stand for 15 minutes before carving. Lavender flowers are an edible garnish for salads, fruit salads and fruit punches. Growing tip: Cut back by a third after flowering or, for those lavenders that flower continuously, do it when bushes start looking untidy. With regular pruning Lavenders will not become too woody. Use the following Mint varieties: Apple Mint, Black Peppermint, Chocolate Mint, Garden Mint, Mint Julep, Pineapple Mint, or Spearmint. Mint sauce with roast lamb is made by dissolving one tablespoon of sugar in half a cup of vinegar and adding a quarter of a cup finely chopped mint. Let it stand in a warm place for 30 minutes. Mint garnish – line a pretty bowl with whole fresh mint leaves and fill it with strawberries or melon balls or add chopped mint to green or mixed salads, new potatoes, peas, beans or tomatoes to give the dish an extra zing. After dinner mint. Add Chocolate mint to filter coffee for a great tasting indulgence. Mint tea, especially chocolate, apple, peppermint, or spearmint, helps to digest a heavy Christmas day meal. 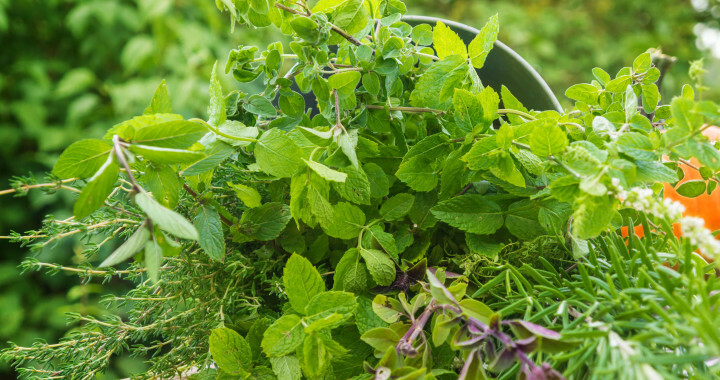 Growing tip: Unlike most other herbs, mint grows best in partial shade and in rich, moist soil. Although it is a perennial it can get scraggly and should be replaced or new plants made from root cuttings. The following Thymes can be used for cooking: Common Thyme, Lemon Thyme, and Silver Thyme. Thyme and Parsley stuffing for chicken or turkey. Combine margarine, 1 tsp chopped lemon thyme, 2 tbs chopped parsley, 1 tsp grated lemon rind, 1 egg, salt and ground pepper. Thyme butter as a garnish and flavouring for cooked vegetables, pasta, pork and steak. Add half teaspoon finely chopped thyme to half a cup softened butter and 1tsp of lemon juice. Thyme fish braai: Combine 50 ml each of fresh thyme and parsley, two cloves of crushed garlic, 80 ml lemon juice and 250g margarine or butter and heat until melted. Season the cleaned fish, and brush with the herb sauce. Grill over medium coals for about 20 minutes on each side, brushing frequently with the sauce. Growing tip: For flavourful thyme do not feed too often or over water. Thyme is very drought tolerant and once established needs infrequent watering. Posted in Growing Herbs and tagged culinary, growing, herbs, tips.